A couple of weeks ago, I thought it would be neat to get a computer similar to my first PC; which was a 286. I’d actually been considering the prospect for some time, but the prices on a DTK 286 (DTK was the brand I had) were a bit high. However I stumbled on a rather cheap listing for a DTK 286 PC; it wasn’t identical to the one I had but was a similar model, which had a slightly reduced case size but seemed otherwise the same, so I snapped it up. It arrived a little worse for wear from the journey- the front of the case, which was attached via plastic standoffs screwed into the metal case itself, had all those plasticsnaps come off- However this shouldn’t be too much of a problem as I’m sure I can get it to stay attached for presentation purposes. When I opened it up to see if anything else had been damaged, I found the network card was out of it’s slot. So I pushed it in. Then I noticed the slot was PCI. 286 systems had 8-bit and 16-bit ISA, so already I knew something was up. 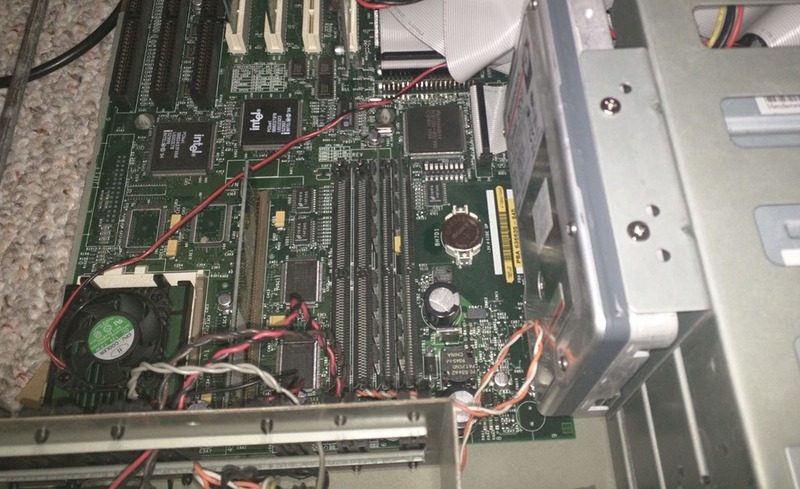 That the Processor had a heatsink, and was a Socket 7 meant this was clearly not a 286 system. Instead, the system ins a Pentium 133 (non-MMX) Socket 7, with 64MB of RAM, a 900MB hard drive, an ATI Mach 64, and 10/10 Ethernet. The Floppy diskette drive wasn’t working correctly so I swapped it for one of my other floppy drives. I also attached one of my CD-RW drives so I could burn data and install programs, to the Windows 95 install that was running on the system. Now, arguably this could be a claim to be made against the seller but I think that it was sold this way by accident; It seems like it is using a specialized industrial motherboard intended to be placed in these sort of Baby AT cases- I don’t think a standard consumer case had Socket 7 and used the large, older Keyboard DIN connector. The motherboard is apparently quite uncommon and more so with the Socket 7 rather than Socket 5. It also has a motherboard Cache “card” installed which doesn’t look to be particularly difficult to find but goes for about half what I paid for the entire unit. 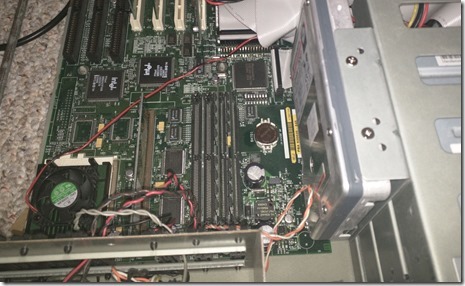 The motherboard is unusual in that it seems to be missing things such as Shrouds around the IDE connections as well as having no serial number listed where specified in the center of the board. My original intent was to fiddle with MS-DOS and Windows 3.1, so realistically this Pentium system could work for that purpose; I have a few older IDE Hard drives I could swap in and set up a dual-boot between MS-DOS/Windows 3.1 and Windows 95. The Mach64 is an older card but is well supported on both Windows 95 and Windows 3.1 as well as MS-DOS, so it seems like a good fit. It only has 1MB of RAM so higher resolutions drop the colour depth- 1024×768 is only doable with 256 color modes, for example- I might want to get some DIP chips to install and upgrade the VRAM, as it has two empty sockets. (Might be cheaper, ironically, to actually get another Mach64 with the chips installed altogether, which is odd) I was also able to add a Creative AudioPCI Card I had lying around without too much hassle; Though there are better options for ideal MS-DOS and Windows 95 audio I might explore later. My main limitation so far is the lack of a PS/2 connector for the mouse and I don’t have a serial Mouse- I found an old InPort Mouse with a Serial Adapter on eBay to serve that purpose, however- As having a mouse would be nice. One thing I was struck by- much as with things like the iMac G3 I wrote about previously, is that despite being quite old, it still performs rather well with things like Office 97. Basically it just proves my theory that if you fit your software choices to the hardware, old hardware is still quite capable. I could write up documents in Word or create spreadsheets in Excel without too much bother and without really missing anything available on a newer system; and the system would work well with older MS-DOS games as well for most titles- and older titles are facilitated by the Turbo Switch, which oddly doesn’t actually do anything with the button but uses Control-Alt-Minus and Control-Alt-Plus to change the speed and the turbo switch light changes accordingly (it goes between 133Mhz and 25Mhz, making the latter about equivalent to a fast 386). » Filed Under: General Computing,Hardware.